Maximum Diameter Basic Wire 3/16" (.187") Maximum Width Strip Metal. 1 5/8" Standard Feed Length 15" Standard Slide Strokes Front 1 3/4" Sides 2 1/4" Back. 1 3/4" Stroke of Sripper Rod. 1 17/32" Motor. 3 h.p. 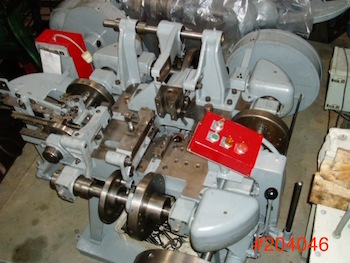 Variable Speed Production 32 - 130 spm Opening in Bed 8" x 6 1/2" Wire Line. 35 1/2" Floor Space 62" x 79" Weight 3500 lbs.